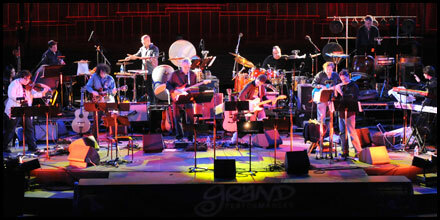 BSG Orchestra Concert Footage Released! Hey all you lucky European BSG fans, you’re about to get an exclusive look at Battlestar Galactica Orchestra concert footage! 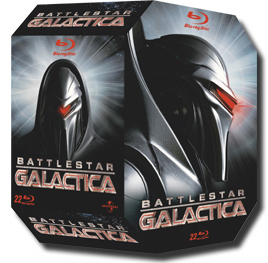 Five songs are being released today as part of the Battlestar Galactica Season 4 BluRay release in Europe! Welcome to the first in my three part “Summer Scrapbook 2010″ blog entry series. 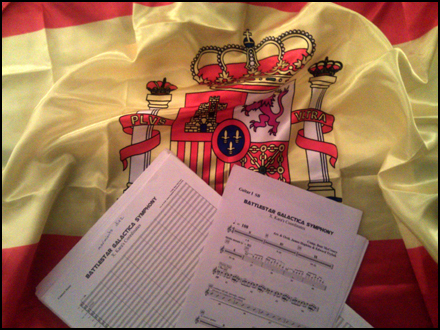 I intended to summarize the past few months in only one blog entry, but I realized that so much had happened to me recently I couldn’t possibly fit it all into one blog: I had my first experience conducting an international symphonic orchestra, premiering my first hour-long concert work in Spain. I crashed Comic Con, and started an epic new season of Eureka. I scored the season finale of Caprica, began two new TV series and a top-secret videogame. My first studio feature film hit theaters. I began work on an exciting new heavy metal horror film. I was nominated for my first Emmy, for my work on Human Target, a show for which I just produced a massive four-hour soundtrack album. I got married and moved into a new house, and began construction on a new studio…. whew! I’m getting exhausted just listing it all. This first blog entry will focus on just one of those adventures: my trip to the Canary Islands for the world premiere performance of the Battlestar Galactica Symphony, as part of the renowned Fimucite Film Music Festival in Tenerife, Spain. “Battlestar Galactica Symphony” World Premiere in Spain! This summer I will conduct the largest and most ambitious “Battlestar Galatica” concert yet. The “Battlestar Galactica Symphony” will premiere in Tenerife, Spain, headlining a concert in Fimucité: The Tenerife International Film Music Festival. This hour-long work incorporates musical material from the entire series, performed by a full orchestra, choir, taiko ensemble and select members of my own Battlestar Galactica Orchestra. This unique combination of the symphonic, ethnic, rock and percussive realms will make this concert the most complete and authentic performance of the “Battlestar Galactica” score ever, and it’s all taking place in the idyllic Canary Islands of Spain. BSG Suite in Symphonic Orchestra Concert, Oct. 24! ONE NIGHT ONLY: On October 24th, the Golden State Pops Orchestra will perform a special tribute to composer Stu Phillips to commemorate his 80th birthday. 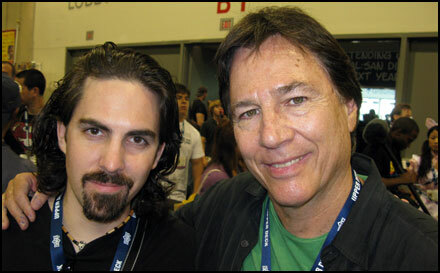 He will conduct his scores from the original Battlestar Galactica, as well as several other projects. Richard Hatch and other new and original BSG alums will be there, and I will be there as a special guest, conducting my new arrangement of Stu’s classic theme! My piece will be a combination of the various moments in my scores in which I quoted Stu’s timeless melody, drawing from “Colonial Anthem” from Season 2, “Husker in Combat” from Razor and, of course, “The Heart of the Sun” from the final episode. Some of my own, original BSG themes will weave in there as well. 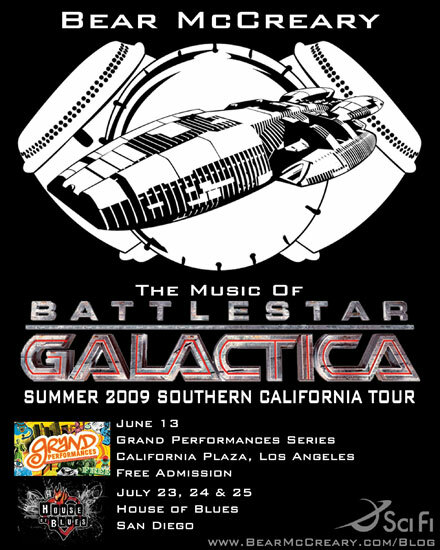 If you missed the summer concerts in downtown Los Angeles, San Diego, or my ballet, Prelude to War, in Germany last spring, this is your last chance this year to hear my Galactica score performed live in concert. Since the concert program also includes Stu’s “Theme from Battlestar Galactica,” I want my “Colonial Anthem” to have all the unique qualities and sounds that set my score apart. So, the orchestra will be joined on stage by BSG Orchestra superstars Paul Cartwright on electric violin, Chris Bleth on duduk and M.B. Gordy on taikos and ethnic percussion. (UPDATE: The line-up has changed. See the bottom of this entry). And even if you did see any of the previous shows, this one will be entirely different, since it involves a full orchestra! This concert will truly be a once-in-a-lifetime opportunity to experience the classic and re-imagined Galactica scores together on one program. There will also be a drawing to win CDs and other goodies signed by me and Stu. First of all, the interview above is among my most vivid memories of Comic Con ’09. Edward James Olmos was being interviewed by NBCSanDiego.com and literally pulled the mic out of the host’s hands. He immediately took over the production, interviewing me and the two vocalists in my band, Raya Yarbrough and Brendan McCreary. This would be just one of countless surprises I experienced during these shows. Comic Con Concerts: What Did You Think? Wow. So much going on at Comic Con here. The first day was INTENSE! Richard Hatch’s panel was amazing and I think the first live concert we played was easily the best show the Orchestra has put on yet. Eddie Olmos was an amazing MC, and the surprise visits from Richard Hatch, Luciana Carro and Michael Hogan brought the house down… not to mention the surprise duet with me and Katee Sackhoff playing All Along the Watchtower on piano. I’ll eventually write an entry about the shows, and put up some photos and media clips. But, in the meantime, check out our official Twitter (@bsglive) and the blog that we’re running on the official band website (bsgorcestra.com). 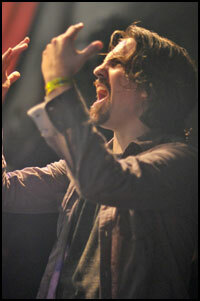 Percussionist Jonathan Ortega is writing it up and he has great insight, cool photos, and a wicked sense of humor! The only thing that bummed me out tonight: I saw some General Admission audience members being turned away from the signing after the show and it just made me crazy (I always wanted to do a big signing for everybody in the first place). Starting tomorrow, I’m going to make damn sure that EVERYONE at the concerts can come to the signing afterwards. I want a chance to meet all of you! Consider this an official announcement! Besides, we’re selling the Season 4 CDs and every other record I’ve done as well as limited edition posters, including this killer design by Andrew Craig. You can all pick them up and get them signed by the entire orchestra! Hey gang, I’m getting ready to head down to San Diego for Comic Con tomorrow night. It’s going to be a crazy week, but I’m looking forward to rocking out the House of Blues with all of you on Thursday, Friday and Saturday. I’ll also make a few appearances at the convention and wanted to let you know about them. If you’re around, stop by and say hi! Moderated by actor/author Richard Hatch (Tom Zarek, Capt Apollo), this panel includes writer / producer Michael Taylor, science advisor Kevin Grazier and myself, providing a review, discussion and Q&A of Battlestar‘s past four seasons and dramatic ending. House of Blues San Diego, 1055 Fifth Ave.
Each night of our shows will be a little different, but the THURSDAY NIGHT performance will be extra special. Not only is it the first place on Earth to get autographed season 4 CDs, but you’ll hear world-premiere performances of new Galactica music from “The Plan” before anyone else. BSG Orchestra @ HOB: What do you want to hear? As you know, I am performing live in concert with The Battlestar Galactica Orchestra at the House of Blues San Diego on July 23rd, 24th and 25th, the week of Comic Con. A few months ago, I asked all of you for suggestions for the Season 4 soundtrack album, in a blog post called “The Season 4 CD: What do you want to hear?” Well, I need your ideas again! 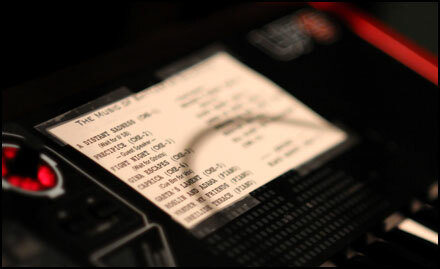 What do you think should be on the set list for our big HOB concerts? For the last song, Kara Thrace herself, Katee Sackhoff, joined me on stage at the grand piano to play “Kara Remembers” (from the forthcoming Season 4 Soundtrack Album). I played the left hand part, and she plucked out the Final Four Theme, just as she did in the climax of Someone to Watch Over Me. Once we had the Final Four Theme going on the piano, the band snuck in, building to “Heeding the Call” and finally “All Along the Watchtower.” The writers and director of Someone To Watch Over Me were in the audience, so this was a very special moment for Katee and me. “Music of BG” July H.O.B. 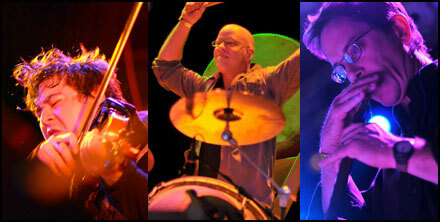 Concerts: Tix Now Available! Finally! Tickets are now on sale for the “Music of Battlestar Galactica” Live at the HOUSE OF BLUES in San Diego during the Comic Con convention: July 23, 24 and 25th! Get them fast, because they are going to sell quick!